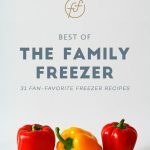 My Whole30 Crockpot Freezer Meal Plan is so popular that I decided to pick some of the recipes and freeze them myself. 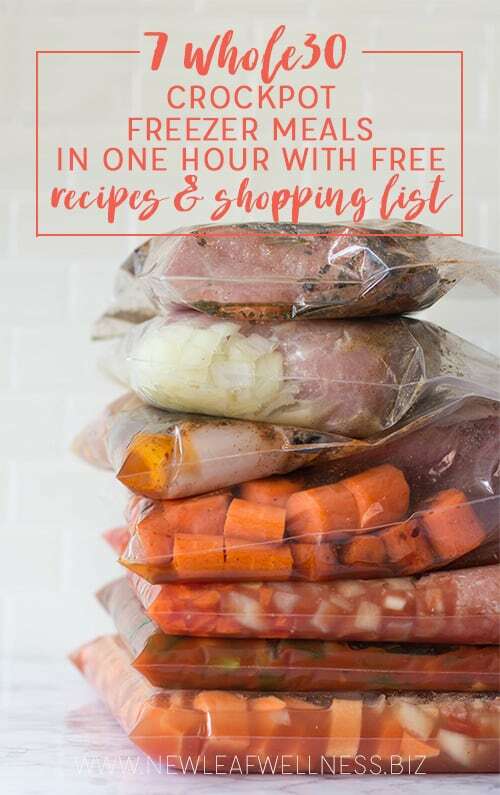 It only took me an hour to make them, and the meals were DELICIOUS, so I’m sharing the free printable recipes and shopping list below. Enjoy, Friends! 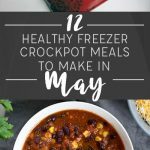 CLICK HERE TO DOWNLOAD THE FREE RECIPES AND SHOPPING LIST. 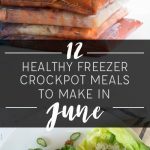 What’s so great about these Whole30 crockpot freezer meals? None of the recipes required any cooking ahead of time so I was able to make all seven in an hour (less than 9 minutes per meal). I bought the ingredients at ALDI and a local grocery store for a total of $73 (only $10.43 per meal!). We already ate the three recipes that were from other blogs and loved them so I know that you’ll love them too. The other four recipes are ones that I’ve shared before and make over and over again. I like to try all of the recipes before creating the printable recipe doc. These were all winners for sure. Print the recipes and shopping list and go shopping a day or two ahead of time. Label the bags with a Sharpie marker or the free labels included with the recipes above. Make the meals in an assembly line with veggies at the bottom, sauces and spices in the middle (so they don’t stick to the bags), and meat at the top (so it’s the first ingredient dumped into the crockpot). 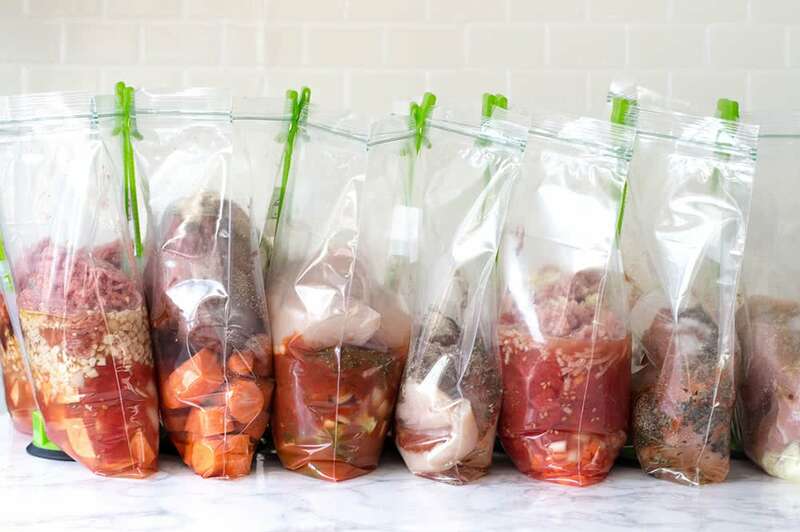 Seal the bags and stack them in the freezer for up to three months. When you’re ready to cook, thaw overnight in the refrigerator or in the morning in water. Cook in the crockpot like normal. So easy!!! You don’t need any fancy tools, but people always ask me what I use, so here are some Amazon Affiliate links: baggy stands, onion chopper, and programmable crockpot. 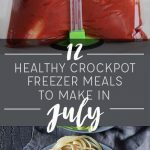 Can any of these be used with the instant pot? Are these scalable? I have a family of 7 and am Head of School at a small-mid sized Montessori school. Not only am I simply busy (like everyone else), but I need to be able to pack lunch each day for 5 kids. They won’t eat leftovers necessarily – they are happy to make their own sandwiches – but I wouldn’t mind packing leftovers so at least I can eat at my desk if no time for a lunch break. You could easily add an extra pound of meat to the recipes. How many people does each feed? Most are 6. It’s detailed my recipe in the printable pdf. I have always had a concern with putting raw meat in with raw vegetables and other ingredients. 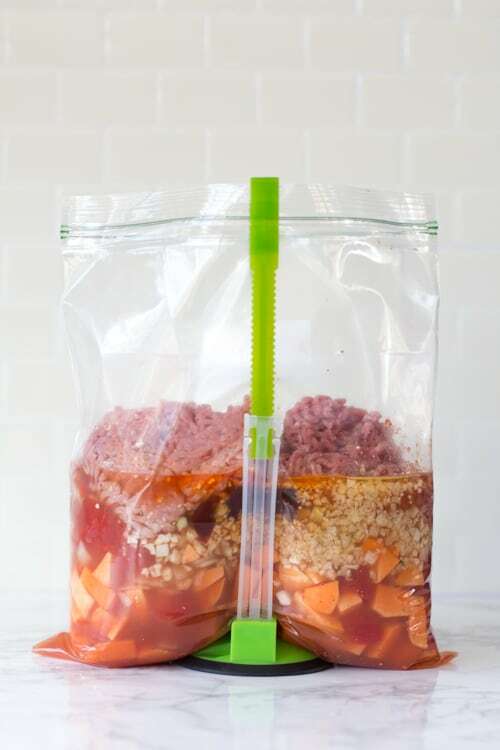 Do you put each ingredient in its own bag ? No, it’s safe in the freezer as long as you cook it before eating. Does each recipe have a photo of thr meal and macros ie cal/kj etc?